Hey guys, remember me!? Sorry for the super long break in posting. Let's hope that doesn't happen again! I'm getting back into the swing of things and what better way to be motivated to clean your whole house and redecorate your living room (yes!) than hosting a baby shower? and all of the other yummy goodies that come with a shower. Two things I loved about this shower: We decorated with things we already had. Like Sarah's grandmother's gorgeous handmade vintage table runner and the borrowed birdcage. And we kept it simple with just a few of our favorite dishes: chicken salad, tortellini and tomato kabobs, fruit salad and hummus with veggies. We dressed up the borrowed birdcage with a little porcelain bird perched on some moss. For a little added color we whipped up a flower ball made out of the heads of fresh green spider mums tied together. I think the overall look of the food tables reads "Classy Anthropology" with a little more "Baby Shower" in the living room, and that's right on par with Kelly's personality! and "about to hatch" down below. Megan (stationary expert... she's even got her own business, Lillian Day). 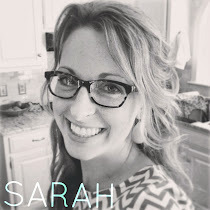 welcome back, sarah! love the nest idea for a shower- very chic! hope you are feeling as great as you look! Such cute ideas! I am hosting a baby shower for my sister in a couple weeks. Im so glad you're back to the blogging world. You've been truly missed! Love the cake and the vintage table runner. Simple and sweet. You are so good with all the little details that make such a difference! best shower ever!! :) thanks friend!